We can supply you with a variety of wooden poles! If you require rustic poles for outdoor projects, we can help. Our poles have been used in various film sets, adverts and tv series over the years. We are also suppliers of pioneering poles for scout troops, providing straight poles from softwood timber, mostly Douglas Fir. We can provide you with staves, too (typically hazel with bark still intact). If you require poles for your tipi (teepee / tepee / wigwam) or tent - full sets or individual poles - we can help! 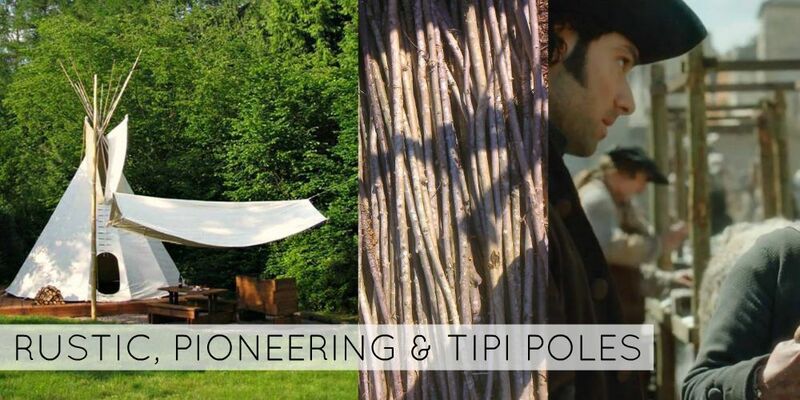 Our wooden poles have been used for many special projects such as gazebos, ship masts, Iron Age roundhouse roof beams, tripod swing frames, rustic curtain poles and handrails, jousting lances, furniture, hammock frames...and much more. For further information on all of the above, please see our sister company's website here.